Yes, this site is global. And not only do we have projects from Russia to South Africa, from Abu Dhabi to Montreal, along with five-star office towers and football stadiums to spas and small homes, but there is also a strong human element this week in terms of how the public responds to architecture. For this writer, the strongest statement of this week is One New Change, London, which will be “an iconic, seven-days-a-week, world-class shopping and leisure destination”, one that will overlook St Paul’s Cathedral. Designed by Jean Nouvel, this 560,000 square foot retail and office space is situated on a very complex site right beside St Paul’s Cathedral, among other historical buildings. The solution, apparently, has been to have a more subtle exterior of an opaque skin in various shades and which also mirrors the architecture around it. Its modern appearance has drawn the ire of Prince Charles who has lobbied to have other architects brought onto the project. The project is hugely symbolic, pointing to a new day, when the traditions of the past, can be viewed from above, with some smugness perhaps, while we tote our reusable enviro-bag as we go off to shop while parishioners below step into storied spaces. Whatever the case, don’t call it “iconic”, this monolith of steel and glass nudging up against St Paul’s Cathedral. How many iconic structures do we need, after all? On to St Petersburg with Gazprom’s new 300+m tower headquarters. The building’s soft curves and skin that changes colour ten times per day depending on the angle of the sun, are certainly compelling, albeit when you see it on its own, not set against the St Petersburg backdrop. The traditionalists and starchitects are battling it out here too, with the community’s clear voice against the project that could blemish the historical cityscape, and even UNESCO’s warning that St Petersburg could lose its world heritage status were the tower to go ahead at its planned height. Today, British Petroleum is madly trying to cap off an underwater runaway oil gusher that has, since April been pouring, at best estimates, approximately 15,000 barrels per day into the Gulf of Mexico. Is this the time, with all the eco-conscious backlash, to erect a monument that could only further cement the public prejudice against high falutin gas company officials? Yes, the building is a symbol, but perhaps not the one the architects and gas officials want it to be. Everywhere, it seems, has become the new Abu Dhabi, where we have another record breaking tower: Capital Gate, the World’s Most Inclined Tower, backed by the Guinness Book of World Records. 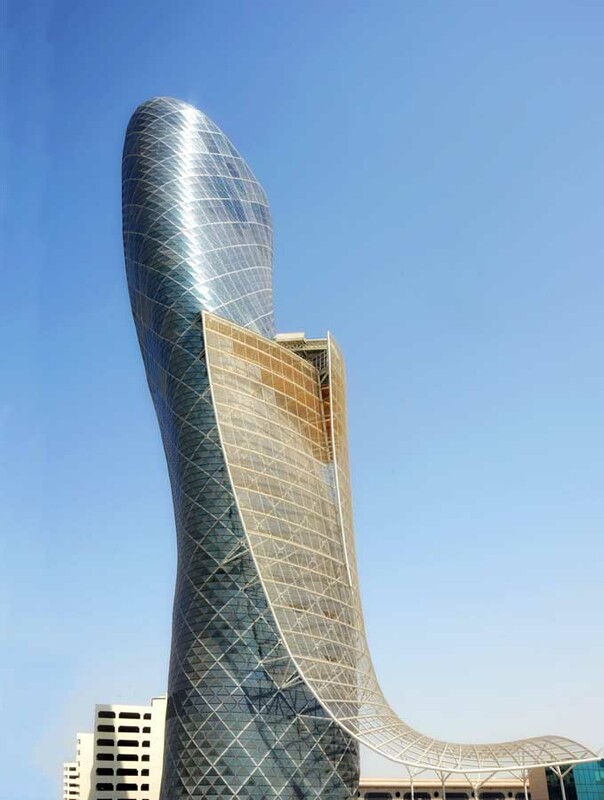 Noted as one of the world’s most complex buildings in terms of the structural strength required to make it lean its 18 degrees off centre, Capital Gate will house the Hyatt Hotel and 20,000 square meters of “premium office space” as well as a cantilevered café hanging 80m above the ground. The royal response is here too, with His Excellency Sheikh Sultan Bin Tahnoon Al Nahyan, ADNEC’s Chairman adding: “CAPITAL GATE is a landmark development for Abu Dhabi and with this recognition the tower takes its place among the world’s great buildings. It is a signature building which speaks to the fore-sight of the emirate”. Amidst all the grandiosity, we also have those who seek to combine the past and the present, to adhere to the ideals that they brought into architecture training about making useful buildings and a better world. From Latin America, we have the Article25 report on architectural needs in earthquake-torn Chile as well as the church of San Antonio de Chepica, which responds to the devastation of earthquakes, the psychic break in the fabric of time, and yet embodies hope in its new assertion of faith. Two other items. The first is the home for the new Scottish Ballet, which seeks to combine both artistry and industry. Here the architect has combined the architecture of an old tramway with the new centre. The result is not smooth and seamless, but industrial and eclectic. There is no symbol of the pirouette or ballet slipper here, but a solid and colourful combination of existing spaces. And, it is clear that it is built with its purpose in mind: helping dancers to practice and to create. Its interior spaces, with clerestories and skylights, are large, airy and workable. Empowered to excel. The theme speaks to the South African arenas, where in a few days time, young men will strive in a singular contest of passion. These low-lying, landscape-embracing structures, with capacities of upwards of 85,000 screaming and shaded fans, embody a people’s newfound sense of hope. Idealism at its best: Team against team, player against player, on the pitch, in a country holding its breath and ready to step into its own new era.